If you're tired of the long lines and ridiculous prices of your local cafe, it's time to invest in your own coffee maker. But what if you aren't sure where to begin? What if you need a starting point for further research? We've put together a list of the best coffee makers of 2019 for the modern buyer. All of these drip coffee machines are available on Amazon, and all of them are ranked with three or more stars. We've tried to include a variety of sizes, prices and brewing types so that there's something for everyone regardless of their coffee preferences. Here is a quick snapshot of our top rated picks. If you're in a hurry, here is a quick list of our top 10 coffee machines. P.S. Ranked in no particular order. Now let's delve into the reviews of the top rated coffee machines one by one. As one of the best coffee makers on the market, the OXO Barista Brain sets the curve when it comes to amazing features and innovative technology. If you're willing to splurge a little for a high-quality cup of coffee, the OXO Barista Brain will take your regular caffeine routine and turn it into a celebration of flavor. This is because it replicates handmade pouring techniques with automated technology that will deliver the same precision as a professional barista. For starters, the OXO Barista Brain utilizes a microprocessor that will self-adjust and self-time based on your brewing settings. It also boasts a steady temperature control of 197.6°F - 204.8°F so that your coffee never gets too hot or too cold. Full flavor extraction is guaranteed by its intuitive design, and stainless steel components ensure that everything is sleek and smooth to the touch. As a bonus, the OXO Barista Brain is also quite simple to use. Everything is controlled with a single dial that feeds into a backlit LED display. If you're looking for a coffee maker that will really give you a jolt in the morning, consider the OXO Barista Brain. The OXO Barista Brain more than lives up to the intelligence of its name. Small and simple, the Bonavita BV1900SS is a great example of why you shouldn't judge a book by its cover. Update﻿: The Bonavita BV1800SS is no longer available (discontinued) and is replaced by the newer version BV1900TS. 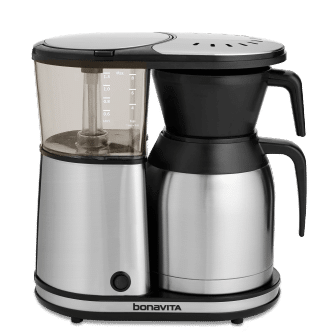 At just 6.8 x 12.4 x 12.2 in inches and 6.13 lbs, the Bonavita BV1900TS doesn't have the grandiose look of a high-tech coffee maker. Looks, however, can be deceiving. With a 1500-watt heater and a 195°F - 205°F temperature range, this unit will deliver piping hot coffee in a matter of minutes. It even boasts a special "shower head" design that will spread water over your coffee grounds in an even, uniform way. This ensures perfect saturation without any dry spots. You might also be interested in the Bonavita BV1900TS's carafe. Not only does it come with stainless steel liners for maximum heat retention, but it also offers a vacuum-walled chamber to prevent spills. You can even throw it in the dishwasher for easy cleaning. All things considered, the BV1900TS is a strong and steady machine that belies its simple appearance. Don't be fooled by its compact size or non-showy design. It has a lot to offer underneath its surface. The Bonavita BV1﻿9﻿00﻿T﻿S is a handy little coffee maker that will last for years. It may not look like much, but as you can see from its product reviews on Amazon, it's a machine that has customers raving. 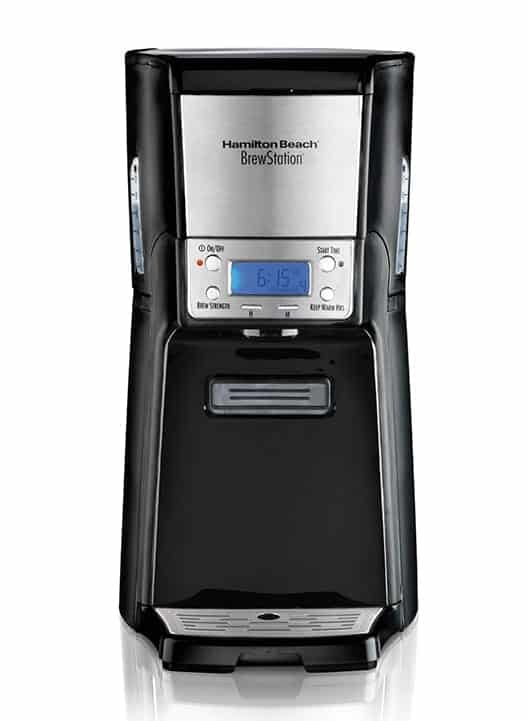 With the perfect blend of new and old, the Hamilton Beach BrewStation makes it easy to get your morning fix. The first thing that you'll notice about the Hamilton Beach BrewStation is that it drips directly into your cup. Without any trays or carafes, it's a one-handed machine that's free of the "mess potential" looming over many conventional coffee makers. The next thing that you'll notice about the Hamilton Beach BrewStation is that it offers many modern functions like a display menu, programmable clock, automated on/off switch and self-regulating warming plate. It will even let you switch modes and brew different types of bold, regular and iced coffee. Despite its quick-and-easy design, its hardware is more than up to the task of brewing a customized coffee beverage. It's rare to find a coffee maker that embraces both old-school convenience and new-school technology, so grab the Hamilton Beach BrewStation while you still can. They simply don't make them like this anymore. Enjoy a new-old fusion when you purchase the Hamilton Beach BrewStation . There's a reason why so many customers are raving about it on Amazon, so check it out and read its reviews for yourself. It may come with a surprisingly low price tag, but that doesn't mean that the Mr. Coffee BVMC-SJX33GT-AM is cheap. You don't have to spend a lot of money to enjoy a top-notch coffee maker. In fact, when you buy something like the Mr. Coffee BVMC-SJX33GT, you'll be amazed at the level of technology that you can own for just pennies on the dollar. 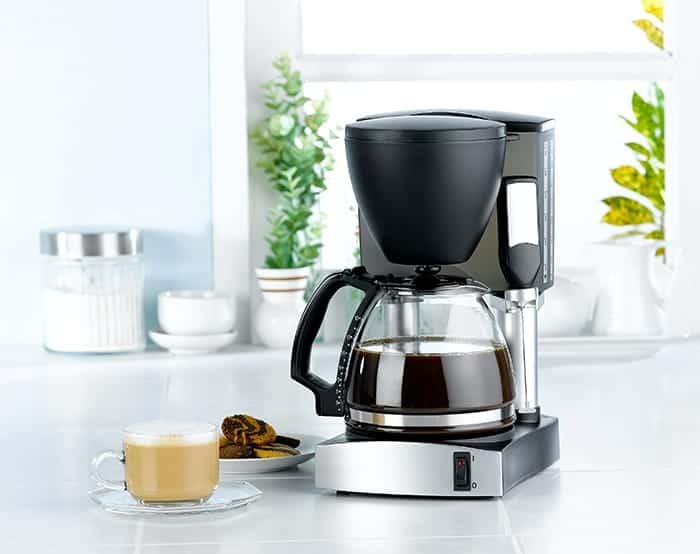 The Mr. Coffee BVMC-SJX33GT-AM offers everything from a "freshness timer" to a "strength selector" to help you create the perfect cup of coffee. It has a dazzling display filled with all kinds of buttons and controls so that you're never confused about your options. You can even customize your machine with special add-on accessories like a thermal carafe! On the flip side, with a price tag that's only a fraction of the cost of other machines, the Mr. Coffee BVMC-SJX33GT-AM won't require your entire paycheck. It's a flexible, functional machine that manages to be both affordable and luxurious. 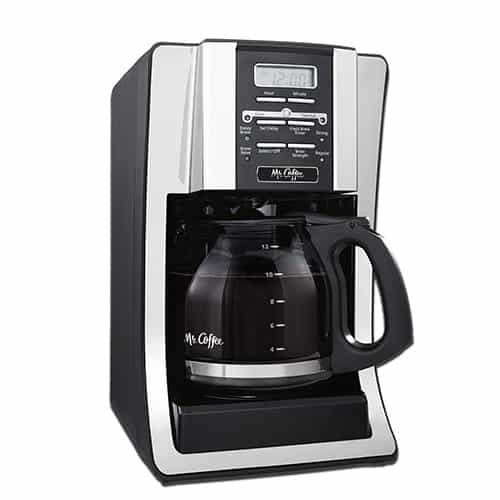 Really, why wouldn't you buy the Mr. Coffee BVMC-SJX33GT? Not all coffee makers are easy on the wallet, but M﻿﻿r. ﻿﻿Coffee BVMC-SJX33GT manages it. Enjoy the luxury of choice when you buy the Hamilton Beach 12-Cup, a coffee maker that will give you premium control over your brewing, pouring and cleaning. We've already reviewed a different Hamilton Beach coffee maker, but this one is also worth your consideration. It offers all of the power and performance that you'd expect from the brand with bonus digital features that elevate it even further beyond its competitors. 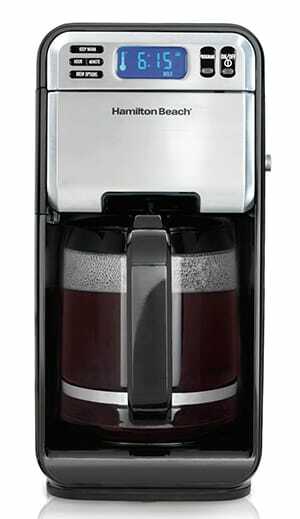 For starters, the Hamilton Beach 12-Cup brewer is extremely simple to use. You'll enjoy easy-access panels and swing-out baskets that keep everything within reach, and removable components can be taken out and cleaned whenever necessary. 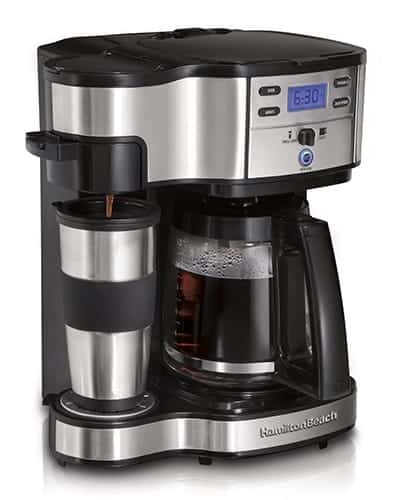 The Hamilton Beach 12-Cup also comes with great digital technology in the form of programmable settings that control time, temperature, blend and volume. Everything is displayed on a front-facing panel with bright, easy-to-read numbers. Last but not least, the base of the Hamilton Beach 12-Cup is mobile. Tiny rollers will ensure that you're always able to access the water reservoir. While the coffee maker itself will stay in place during brewing and pouring, it's a simple matter of swiveling the base to reach the reservoir. For sheer convenience, it's hard to beat the Hamilton Beach 12-Cup. Give yourself options with the Hamilton Beach 12-Cup. Believe it or not, this unit has even more features than we've listed here, so visit Amazon to see the full extent of them. Designed for serious coffee addicts, the BUNN BT Velocity Brew is a serious machine that was built to impress. 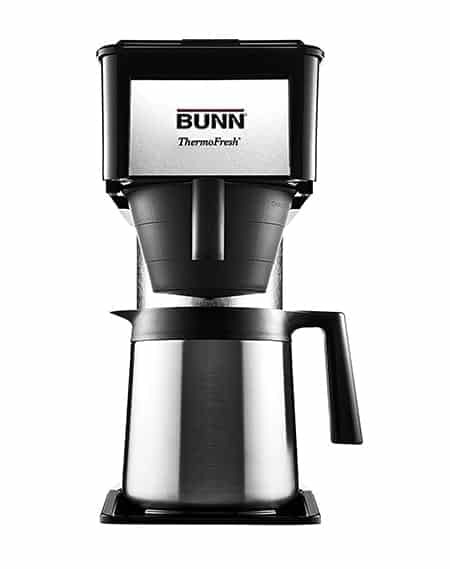 Capable of brewing almost a dozen cups of coffee in just three minutes, the BUNN BT Velocity Brew isn't messing around when it comes to power. Not only does it boast a stainless steel water tank with a 800-watt heater and maximum water temperature of 200°F, but its carafe is also sealed, insulated and vacuumed to ensure that your coffee stays fresh and hot even after it leaves the machine. There are other things to love about the BUNN BT Velocity Brew as well. For example, its large volume capacity means that you can brew anywhere from 20 - 50 ounces of coffee without needing to replenish your supplies. The whole department will be coming into your break room to sample your equipment. You can even guarantee the BUNN BT Velocity Brew for three years. If you aren't completely satisfied with the coffee that comes out of it, the brand will give you a full refund. How's that for service? Stop playing games with your coffee. If you're ready to invest in a high-power, high-output coffee maker, get over to Amazon and order the BUNN BT Velocity Brew. With dual brew settings, the "two-way" nature of the Hamilton Beach 2-Way Brewer gives you unparalleled control over your coffee choices. If you've been debating the merits of a single-serve machine versus a multi-cup brew system, the Hamilton Beach 2-Way Brewer will solve the problem by giving you both options in a single machine. The single-serve side comes with a mesh filter and brew basket. It holds one coffee pod at a time, so you can brew just a few ounces to get you going in the morning. 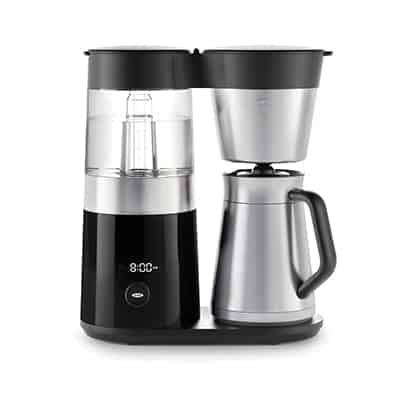 The multi-brew side offers a large carafe and water reservoir that will brew a whopping 12 cups at once. Whether you're burning the midnight oil or just preparing enough coffee for an entire board meeting, it will guarantee high volumes of coffee with low amounts of fuss. Say goodbye to wasting large pots. Say goodbye to making too much or too little based on an early-morning whim. With the Hamilton Beach 2-Way Brewer, you'll always make the exact amount that you require. Enjoy the best of both worlds with the H﻿﻿amilton Beach 2﻿﻿-Way Brewer. As its Amazon page will tell you, it gives you a multitude of brewing options in one convenient package. Get creative with the Moccamaster KBT, a coffee maker that puts you firmly in control of things like time and temperature. Advertised by its manufacturers as "the last coffee maker that you'll ever need to buy," the Technivorm Moccamaster KBT certainly tries to live up to its promise by offering a full range of features and brew options. 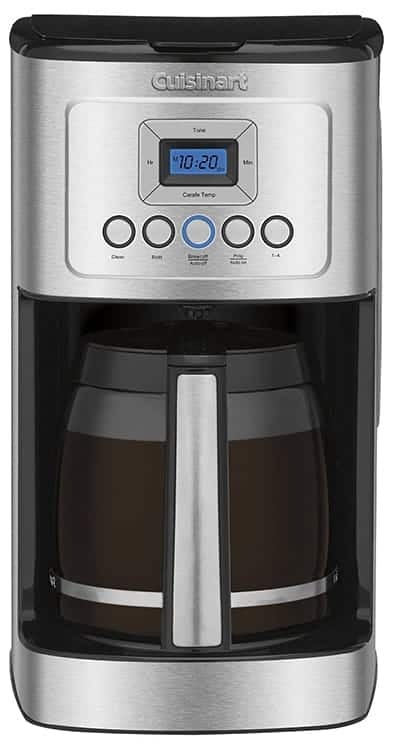 Not only does it come with perks like automatic power settings and manual drip-stops, but with a 10-cup, 1.25-liter volume capacity, it will percolate for a long time without needing a refill. Perhaps the biggest selling point of the Moccamaster KBT is its heat. Utilizing copper heating elements with a temperature range of 196°F - 205°F, it's a machine that will get your coffee nice and hot. But don't worry if you don't like tongue-scorching flavors; with the Moccamaster KBT, you control everything about your coffee, so you can turn down the fire with just a few simple buttons. 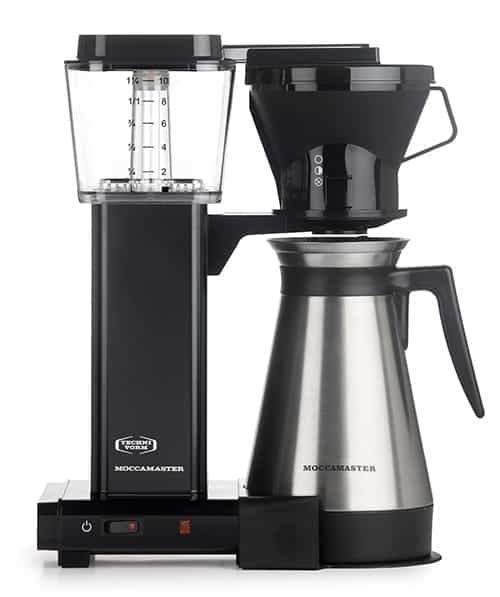 Did we mention that the Moccamaster KBT is very easy to use? All features are controllable; many parts are removable. You'll be able to brew, filter, clean, saturate and time things to your own specifications. You can even choose between half- and full-carafe if you're running late for a meeting or experimenting with new coffee flavors. If you're looking for the best coffee maker on the market, it's a strong contender for the title. It may take up some counter space, but the Moccamaster KBT is worth it. All things considered, the Moccamaster KBT is a great unit for both first-time buyers and veteran coffee critics. If you like options, the Cuisinart DCC-3200 lets you control just about everything but the color of your coffee. Maybe you like it regular. Maybe you prefer to go bold or go home. Regardless of how you take your caffeine, the Cuisinart DCC-3200 is designed to give you a one-of-a-kind taste experience. A programmable menu will allow you to fiddle with various settings until you've determined the right ones for you. Automated controls will turn it on, shut it off, make it hotter, adjust its cup size and keep track of its cleaning schedule. Even the drip-free sprout was designed with your convenience in mind; if you're tired of splashing coffee on your hands and counters, this is the machine for you. Some coffee makers force you to conform to predetermined flavor profiles. The Cuisinart DCC-3200 thinks that you're smart enough to know your own coffee preferences. No matter how you like it, this drip machine will create it for you. There's a reason why the Cuisinart DCC-3200 is one of the top sellers in "coffee machines" department. We've actually been tame in our praise compared to its reviewers, so check them out for even more enthusiasm! 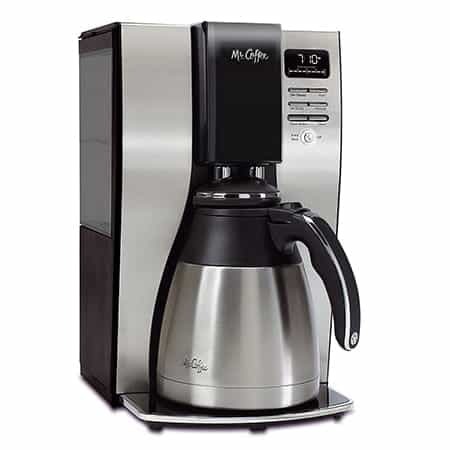 Like the name implies, the Mr. Coffee Optimal Brew creates an optimal coffee experience. What makes a good coffee maker? Everyone will have a different answer, but there's a good chance that the Mr. Coffee Optimal Brew will meet their standards anyway. It's a strong all-around machine that will allow you to customize and control your morning fix. You see, the Mr. Coffee Optimal Brew doesn't just focus on quantity; it also pays attention to quality. That's why its water filtration system will remove 97 percent of the impurities in the stream, and that's why its automated features include things like intuitive grab-and-go technology that will allow you to enjoy a cup of coffee even before the brew cycle is complete. The Mr. Coffee Optimal Brew will even inform you when it needs to be cleaned. It isn't enough to simply make good coffee. The entire brewing process needs to be streamlined for efficiency and quality control, and that's where the Mr. Coffee Optimal Brew excels. If you're looking for a top-notch coffee experience, let this machine guide the way. 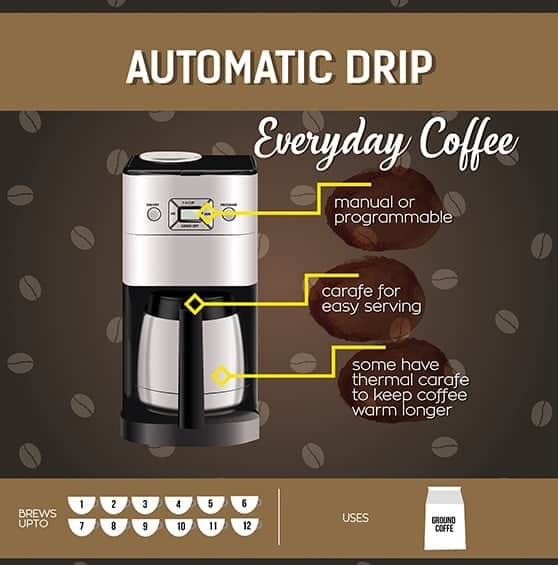 From automatic freshness indicators to advanced water filtration systems, the Mr. Coffee Optimal Brew makes it easier than ever to create the perfect cup of coffee. Whether you're looking for a single-drip machine for your dorm room or an industrial brewer for the entire department, these are just a few of the best coffee makers that money can buy. Good luck with making your final selection! Pro Tip: If you're looking for an all-in-all home coffee station, then you should definitely read our review on Ninja Coffee Bar. It can be difficult to understand the world of coffee makers. The good news is that we're here to take the guesswork out of your purchase decision! If you're ready to invest in a coffee maker, here are just a few things to consider before handing over your credit card. There are also special coffee grinders, percolators and milk frothers that you can purchase to supplement your coffee-making unit. All models have their own pros and cons, so do some research to figure out which is best for you. Coffee makers come in all shapes and sizes, so you'll want to measure your countertop space in advance. If you don't have room for a large, stainless steel multi-cup model with built-in carafe, you might have to limit yourself to something a little more compact. How much coffee do you drink on the average morning? Some machines are "single-serve" or "one-cup" units that only brew a few ounces at a time. Others are "high volume" machines that will brew enough for entire offices. Which will best suit your needs? If you drink from a variety of cups, mugs and thermoses, look for a coffee maker with adjustable trays, sprouts and drip nozzles. This will keep you from making messes as you tilt your coffee maker in strange directions under oddly-sized containers. It can also be quite useful for a family with different coffee needs. Speaking of families, if multiple people will be using your coffee maker on a regular basis, it might be worth investing in a high-tech machine with a programmable memory. These units will store your brewing, grinding and heating information so that you don't have to input your preferred settings every single morning. It's increasingly common for coffee makers to come with automated on/off buttons and self-cleaning cycles. If you don't have the mental faculties in the morning to work a complicated French press, you might benefit from a machine that will manage itself with no effort on your part. There's no end to the special features that you'll find on modern coffee makers. They can include everything from colored alerts to advanced water filters for higher-quality roasts. You can even find eco-friendly units that will help you protect the environment while you enjoy a cup of joe! Last but certainly not least, think about the short- and long-term costs of your preferred coffee maker. Not only will you need to pay for the unit itself, but depending on its capabilities, you might also be on the hook for pods, filters, coffee beans and special cleaning equipment. Consider all potential expenses when planning your budget. These are just a few things to keep in mind when finding and selecting a coffee maker. At the end of the day, the most important thing is that you feel comfortable with your choice. Drip machines are without a doubt the most common coffee brewing machines; they’re everywhere, from coffee-shops to people’s homes. That’s for a good reason: they’re so easy to use. It’s true that they are quite voluminous, but that’s not really a problem for the vast majority of people. If you want to purchase one for yourself, you probably have some questions you want answers for. If so, you’ve come to the right place. Let’s take one thing at a time. 1. Why would I consider purchasing one? First of all, they’re automatic, so while your coffee is brewing, you can do other things. Second of all, they’re quick. You won’t need to wait too long to get your much-needed cup of gorgeous caffeine. 2. Is a drip coffee maker cheap? Yes, the price usually starts somewhere in the range of $25. But of course, the price will vary according to a few factors, like features, size, and accessories. The place where you buy it from may also affect the pricing, but not necessarily. Nothing easier than this. Just unplug it, get rid of the used grounds and wash the detachable components, like the decanter and the basket. Don’t ever put the entire machine under water. Make sure you wash the parts properly, so the coffee doesn’t get bitter. It depends on what model you purchase. Some of them are really flimsy. If possible, aim for OXO, Bonavita or Technivorm. Those are the most durable brands out of them all. Obviously, cleaning your coffee machine will prolong its life expectancy. Stainless steel is much better than plastic, so if you have the chance to buy one made of stainless steel, don’t think twice about it. Plastic is prone to be deformed in the long-run, due to the temperature of the coffee. A coffee maker is a great acquisition if you get it for the right price and with a suitable array of features. You should also keep an eye on the material it’s made of, to make sure that you won’t have to change it after a couple of months. Did you ever own a drip coffee machine or will this be your first buy? Let me know in the comments below. I purchased the Bonavita and have not been disappointed. I just want good, hot coffee and the Bonavita provides it. I purchased a Bonavita and am very disappointed. The carafe does not keep the coffee hot. The first cup is fine, but if you want a second cup, plannin heating it up in the microwave.